If you’ve got limited time in Lisbon, then look no further than this private 4-hour tour of Sintra’s majestic palaces, ideal for first-time visitors. Travel with ease from Lisbon and take a whistle-stop tour of UNESCO-listed landmarks such as the Castle of the Moors, Quinta da Regaleira, and the spellbinding Pena National Palace. Plus, you’ll visit Cabo da Roca, Europe’s most westernmost point. Hotel pickup and drop-off are included. Depending on the start time chosen at checkout, your half-day tour begins with pickup from your Lisbon hotel at 9am or 2pm. Following a 1-hour drive, you’ll arrive in Sintra and ascend to the summit of the forest-clad Sintra Mountain. Stop first at the atmospheric Castle of the Moors, whose position 1,351 feet (412 meters) above sea level commands views all the way to the Atlantic Ocean. 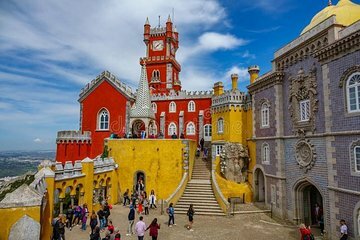 Then, proceed to Pena National Palace, a fairytale castle characterized by lemon yellow domes, to take a tour of the UNESCO World Heritage site. From here, you’ll visit the mysterious estate of Quinta da Regaleira, Monserrate Palace, and Cabo da Roca, the most western point in Europe. Your tour concludes with hotel drop-off in Lisbon.